Facilio is clean, modern and professional One Page Creative Isometric Creative Agency PSD Template. 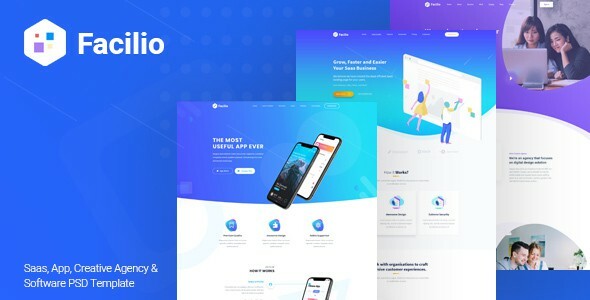 It is clean, modern and simple PSD template for creating the website for SaaS, App, Business, Agency, Portfolio, service sites and much more… The Template is based on 1170 Bootstrap based design so this Template will be 100% fluid responsive on any device. Everything is in the Documentation file so that you can change anything easily. Facilio PSD Template provides a powerful way to showcase your work and Promote your business. How to edit PSD Template. In order to edit the file, you need to have Adobe Photoshop CC or CS6 version installed on your system and the fonts mentioned in the credits. After open file in Photoshop you can see on the right layer manager. We have already organized the layers and grouped into folders. Select the layer from layer panel, which you want to edit or make changes and perform the required editing. That’s all! Enjoy.